« The envelope, please . . . Here is the salad that we served during our wine-tasting party. It paired beautifully with the La Crema Pinot Noir. Everyone loved the ginger crostini in this salad – and you will not believe how easy it was to make. 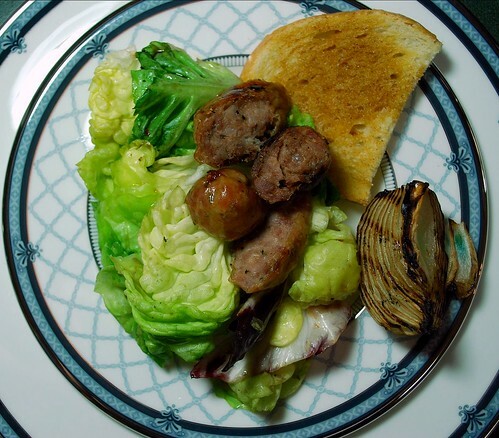 This would be a perfect salad to serve at a cook-out – the grilled flavors of the sausage and the onion are complimented so beautifully by the balsamic. Preheat oven to 300 degrees. In a small bowl, mix together the olive oil and the ground ginger. Brush the ginger mixture generously on the bread slices. Place them on a baking sheet, and bake until toasted and crispy, about 15 minutes. Meanwhile, using a grill, grill pan, or George Foreman, cook the sausages over medium-high heat, turnning as necessary, until browned and crispy on all side, about 15-20 minutes. Pour the balsamic vinegar over the onion wedges. Grill on both sides over medium-high heat for about 4 minutes on each side. The wedges should become soft and slightly charred. In a large bowl, toss the greens with the balsamic vinaigrette until the greens are lightly coated. 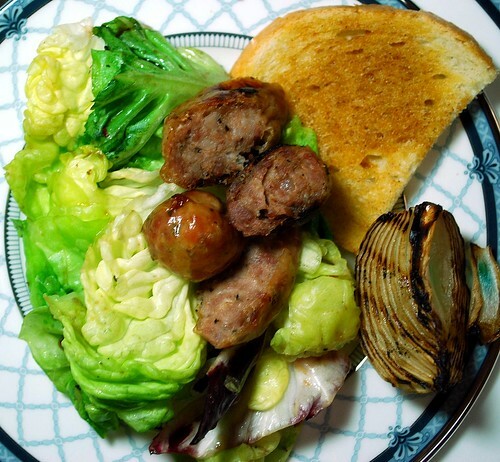 Divide the salad into 6-8 portions, topping each with a grilled onion wedge and a ginger crostini. 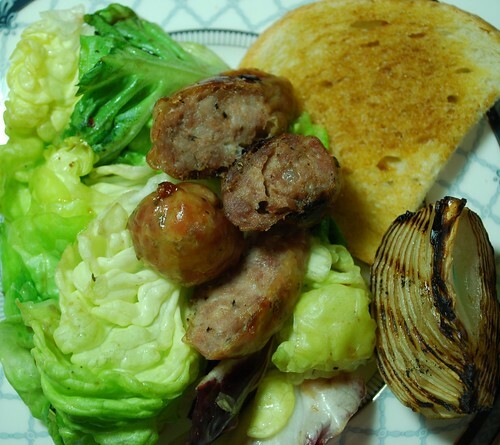 Slice the sausages diagonally and divide the pieces among the salads. Serve immediately, and enjoy!